After the collapse of Greece, Europe is being threatened with yet another financial crisis. This time, from Italy. The unemployment rate in Italy is a staggering 12.4% as of March 27 – an increase of 4.95% from last year. Even worse, Italy's banks hold 40% of all the bad loans within the countries sharing the euro, The New York Times reported on Nov. 20. In order to fix the problems, the Italian government has sought to spend more money to spur the economy. But the spending will only present a short-term fix to Italy's debt crisis. You see, Italy's stagnant economy, inadequate banking system, and bloated public sector are all signs that the country is facing a troubled future. According to experts, Italy today checks all too many of the boxes for the makings of a full-blown economic and financial crisis within the next two years. The economy of Italy is the third-largest national economy in the Eurozone, and the 12th-largest by gross domestic product, or GDP. However, Italy is the only nation within that bloc that has actually seen its economy shrink in comparison to the size of its population. Growth has stagnated for decades, almost 40% of its youngsters are out of jobs, and it's saddled with one of the world's highest debt loads relative to the size of its economy. Its debt-to-GDP ratio – the measure of a country's ability to make future payments on its debt — is 133%, second in Europe only to Greece. "[Italy's] economic performance since 2008 has been abysmal," wrote Desmond Lachman of the American Enterprise Institute on Dec. 29. "Indeed, Italian living standards today are about 10% below where they were 10 years ago." 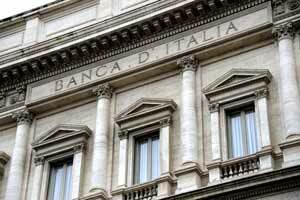 At the moment, the general outlook for Italian banking is everything but encouraging. You see, the economy has been struggling for a number of years, and borrowers have been defaulting, creating a mountain of bad loans. In fact, bad loans in Italian banks totaled close to $400 billion in 2016, according to the International Monetary Fund (IMF). 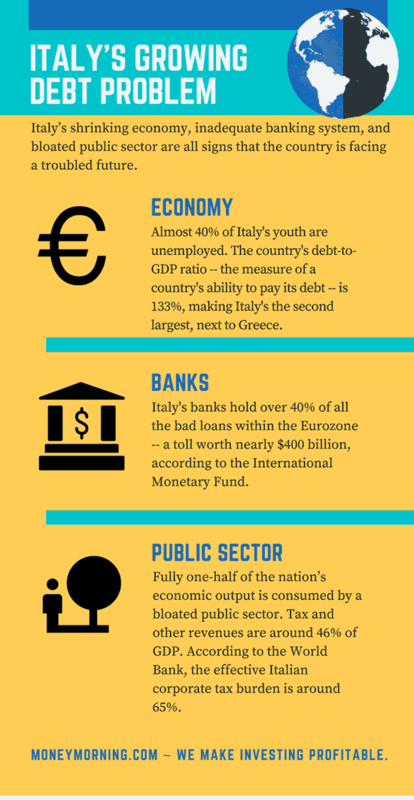 Most of these are piled up in large commercial banks, commonly originating in the construction industry, manufacturing, and real estate – all industries that have contributed to Italy's debt crisis. While the banking crisis in Italy is troubling, the main concern isn't the mass amounts of bad loans, but who owns those bad loans. But in Italy there's an additional problem: households own about a third of the total. This means when the big banks fail, the Italian people suffer exponentially as a result. You see, in most countries, institutional investors — including pension funds and insurance companies — are the main investors in unsecured bank bonds, reported Newsweek in December 2016. "Italy's large public sector and bureaucracy is legendary," wrote The Independent in June 2016. The size of the government payroll is not matched by the quality of public services, Marketwatch reported in May 2016. To account for the high government costs, Italy has one of the highest tax rates in the world. In fact, tax and other revenues were around 46% of GDP in 2015, making Italy the sixth-highest country in terms of tax-to-GDP ratio. And Italy's public sector debt as a share of GDP is now the second highest in the Eurozone. High tax rates like the ones in Italy are concerning, especially for investors looking to expand into the country. In fact, the high tax rates divert investment away from Italy. Even worse, according to The Independent, there are around 100 new tax laws affecting companies annually in Italy. This stifling tax burden helps to explain why Italy's economic output is stagnant. Not only are investors and businesses steering clear of Italy, but the government is actually spending more to keep the country afloat. According 2017 data from the Heritage Foundation, government spending has amounted to 50.9% of total output (GDP) over the past three years, which is an increase of 22.3%. For reference, government spending in Greece was 54% of total output in the year leading up to its collapse. "More spending, bigger government, higher taxes…" wrote Dan Mitchell, a fiscal policy expert for the Cato Institute, on his blog in July 2016. "This definitely won't work."